I’m beyond excited about the new endeavor that Children and Family Urban Movement will embark on this May. Like a new chapter in our history, the ability to expand our programming, spread out in a new permanent space, and deliver a positive learning environment will position CFUM for a future of impact for our participants. For over 25 years CFUM has served the mission of creating a community that supports the potential of children, youth, and families through educational success, healthy living, and community engagement within in the gracious walls of Trinity United Methodist Church. Over those decades our location – just steps from Moulton Elementary School and centered in the heart and soul of the River Bend, King Irving, and Mondamin Presidential neighborhoods allowed us over the years to extend to thousands of youth quality programming, education, and outreach. As humble servants to our neighborhoods, CFUM’s zero-cost programming was met with waiting lists and demands for expansion. Rented space and borrowed classrooms helped meet bourgeoning needs, but now is the time to unify our children and our programs under one roof for the good of our students and families. On May 31, 2018, CFUM will host a Groundbreaking Celebration on the lawn of our new location at Ninth Street and College Avenue. The construction of this new multi-use facility will begin after the last day of school this year (May 2018) and is estimated to be completed for the first day of school in August 2019. In our neighborhood, the average rate for high school graduation is a staggering 62 percent but for those students involved in CFUM programming, that rate is 100 percent. These are the outcomes we’re proud to affect and the families and futures we can impact. The truth is our families are hardworking, pride-filled Iowans with a vision for their futures and most especially for those of their children. For so many, their CFUM student is the first in the family to face the achievable reality of going to college. Those are the successes we work so hard to facilitate by taking students and families to campuses for visits, helping them with the process to encourage our students on their journey. How could moving one block make such a difference? For decades, CFUM has done the quiet work of establishing strong foundations and footings for Des Moines’ neighborhood youth. As a staple to the nearly 100 combined city blocks of the River Bend and King Irving neighborhoods, we’ve become trusted next-door neighbors committed to improving the area, teaching students to respect their backyards, and establishing a sense of pride for this place we call home. 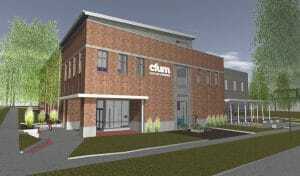 That’s why when our physical needs and student waiting lists grew, the CFUM Board of Directors asked us to dream. Our connection to and tradition of open communication with the neighborhood along with the “front-porch” welcome we extend to all made it evident that we needed to dream with our neighbors first. From one-on-one meetings to neighborhood association forums, CFUM’s constant dialogue with our community helped us launch this journey with their blessing. This new building will be a permanent structure that will unify all our programs, students, families, staff, and volunteers under one roof. In the weeks that follow, we’ll share more details about the building, its features and how together we can foster the uniqueness of each child to help them soar into futures they deserve.